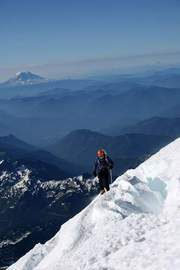 John Golden climbs Mt. Rainier. 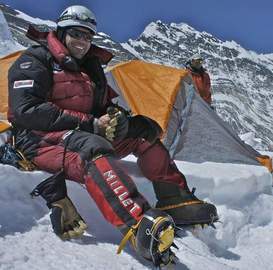 The St. Charles man formed a foundation for orthopedic research and used his Everest climb to raise $170,000. Life certainly has its peaks and valleys, and John Golden has seen the extremes of both. Five years ago, the 43-year-old St. Charles man and former health insurance executive was in a valley – a grim diagnosis from his doctor that because of a football knee injury, he would never again climb stairs. This past May, Golden reached the ultimate of peaks – the uppermost slopes of Mt. Everest. After 23 knee operations and an experimental surgery, Golden was determined to rehab so he could: play with his kids, Johnny and Isabella, now 7 and 8; lose weight; and do something active. He accomplished the first two and told his doctor he wanted to climb a mountain, since running was not allowed. The 1984 Glenbard East High School graduate first scaled Mt. Ranier in June 2007. “It was an amazing moment to get to the top of that mountain after (the doctor) told me to go buy a ranch house because ‘you can’t do stairs,'” he recalled. Golden and two others made it to within about 1,000 feet of the peak before a blizzard forced them back. Golden’s journey began on a football field for the Northern Illinois University Huskies where he shattered his right knee. Over the years, his left knee began to deteriorate because he was overcompensating for the right one. After many surgeries and constant pain, Golden was told by a doctor he would eventually need an artificial left knee and he should buy a ranch home without stairs. Golden sought advice from numerous other doctors before finding Rush University Medical Center surgeon and doctor Brian Cole, who reconstructed Golden’s knee with tissue and cartilage from donors. After Ranier, Golden wanted to do more to show the surgery – he calls it the “gift of opportunity” – worked. So he talked with his guide, John Shea of Boston, about climbing Everest. To prepare, Shea took Golden on 14 climbs to hone his skills. He was gone a lot of weekends, but turned training into a family event – buying a custom-made bike with four seats so the whole family could ride, and convincing his wife, Marianne, to come with him to Everest and that his goal wasn’t a midlife crisis. Her trip was also part of a regiment to exercise more and reduce her cholesterol. Golden also formed a foundation to raise money for orthopedic research. He said he has raised more than $170,000 – $1 for every foot he has climbed – through personal donations and pledges to liveactivenow.org. Word of Golden’s story spread through climbing circles and eventually he hooked up with Discovery Channel.